Ok. Here goes. I try really hard not to stray into the political arena on this blog. I am well aware that politics can be even more divisive than religion and, while I'm more than willing to draw a line in the sand when it comes to my spiritual beliefs, I'm more reticent to be so dogmatic about my political views. But when politics is clouded by people's (mainly the media's) refusal to deal with the truth, I draw that line. I live in Arizona. Gasp! Yes, I live in the state with (supposedly) the big brouhaha about illegal immigration law enforcement. I say supposedly because you need to understand that the picketing and protests you see on the news are handpicked scenarios chosen and capitalized on for the sole purpose of making the rest of the country believe we're all throwing eggs at each other in the streets here. And the media has certainly achieved their goal. Cities in other states are calling for "Arizona boycotts," folks like Oprah and and her pal Gail King are giving their "authoritative" spin on things, pop star Shakira conferred with the mayor of Phoenix about the situation and the NAACP's cry of "racial profiling" has been picked up as the mantra of the day. I have watched time and again as national media reporters and anchors have cut off anyone truly knowledgeable who tries set the record straight by insisting that the law does not provide for racial profiling. Just this morning on Good Morning America I watched Gail King (who has earned expert status simply by association with her "expert" friend Oprah Winfrey) talk about how the Arizona law "scares" her because "anyone just walking in Arizona" (she speaks of Arizona as though it's a park one visits, not a state in the union) can be stopped if they look like an illegal alien. Well, I would understand that fear if it were well-founded, but it's not. The law does not allow law enforcers to just stop anyone "walking around the state" and ask for identification. It does allow law enforcers to ask anyone they've apprehended, pulled over, or stopped for other questionable activity (like speeding, cramming 25 people into a 15-passenger van, loitering, trespassing, etc.) for proper identification. That is the truth of the matter. What the media is passing out as truth, simply is not. Here are some things you may not know if you don't live in a border state. I didn't know these things until I moved here five years ago. By the way, I'm just about 10 miles from the Mexico border. Most Mexican-American citizens are very understanding about supplying the necessary paperwork. I have a friend, Rosita, who often jokes about her own debacles with that paperwork. Married to a retired U.S. Marine, she has numerous tales about bringing along the wrong paperwork on a trip, forgetting her paperwork, or just fretting about remembering to bring it along when traveling across the border. But Rosita understands the necessity of that paperwork and doesn't begrudge the law at all. Mexicans who have entered the U.S. legally often resent those who don't, even though they certainly understand their plight. About 500,000 illegal immigrants are suspected to have lived in Arizona in 2008. It is doubtful that number has decreased any in the past two years. In 2004, U.S. Border Patrol arrested approximately 3,000 illegal immigrants daily. They estimate that for every one they arrested, three others remained at large. Thus, it is estimated that in 2004 over 5 million illegal immigrants entered the U.S.
Well over 70 percent of illegal immigrants come from Latin America, and most of those are from Mexico. Well over half of all illegal immigrants enter the United States through the state of Arizona. It is not unusual to encounter illegal aliens or to find the clothing, trash, or blankets they have left behind in our local hiking trails just miles from my house. In fact, we have not hiked in the Huachuca mountains yet when we have not seen either the illegal immigrants themselves or evidence of their recent presence. I have friends who live just miles from my home who encounter illegal aliens in their yards, standing at their door, or crossing through their pastures weekly. Recently a local rancher was killed by illegal aliens in his own pasture. I know of this incident because people in my church were personally acquainted with this man. However, this is not an isolated incidence. Arizona spends millions of dollars every year educating, providing healthcare for, and incarcerating illegal aliens. Our local hospital provides medical care for illegal delivering mothers and their babies weekly. Arizona Senate Bill 1070 can be reviewed here. Read it literally. Remember, it is a document of law, meant to be read and interpreted by the letter, not loosely or with wide range of interpretation. 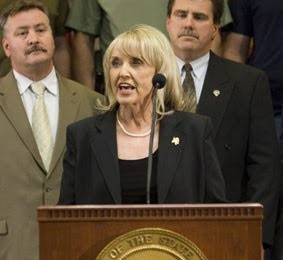 Governor Brewer's approval rating has risen from approximately 40% to approximately 56% with the passing of this law. Most Arizonan's (at least 70%) favor the passing of this law and tougher illegal immigration regulations and enforcement. I understand the wide range of feelings that people have about such things as immigration, racial profiling, and civil rights. But we can't make laws based on feelings. We have to make them based on facts. When we don't get the facts straight we end up acting out of fear. Thus, folks like Gail King and others "fear this law." Senate Bill 1070 is nothing more than a "booster shot" law. It simply reminds and encourages law enforcement officials to enforce the federal laws that are already on the books but not being followed, once again, out of fear. John 8:32 says, "and you shall know the truth, and the truth shall make you free." Granted, Jesus was referring to the truth of God's Word in this statement, and we know that the Bible is indeed truth. It is the ultimate weapon of truth in our lives as we fight the lies of the enemy. But Jesus' statement also reminds us to always deal with truth. Only in the light of truth can we make wise and appropriate decisions, judgment calls, and, yes, laws. I should stop here because if you're still reading you're undoubtedly ready for me to bring things to a close. But I have one more thing I want to say before I pause for the weekend. I don't remember a lot of what my journalism professors said verbatim while I was in college. But one admonition has stuck with me for almost 24 years now. I remember one professor warning us against "deductive journalism." He defined this type of irresponsible journalism as a reporter's attempt to build a case with a conclusion already in mind. In other words, the professor was warning us that shows like 60 Minutes and 20/20 often look at a story from the angle of an already-established conclusion and simply build a set of facts and expert opinions and examples to prove their point. Yes, they may throw in a rebuttal or two, but for the most part they are carefully crafting a story that supports their presuppositions. Folks, there's an awful lot of that going on out there these days, not just in regards to this Arizona state law, but in regards to all sorts of agendas. If my professor thought it was necessary to warn his journalism students of this type of irresponsible reporting in 1985, don't you think we need to be even more aware of it in 2010? I think so. I'm not telling you not to watch news shows. I watch 20/20 almost weekly. But I'm encouraging us all to be seekers of truth more than simply being gullible consumers of entertainment and opinion. Don't settle for what a journalist feeds you. Don't allow them to pull at your heart strings and disengage your mind. And don't assume that the journalist has searched until he or she has unearthed every possible fact and is presenting you with a square deal. More than likely, they have not and/or they are not. Be discerning. Be wise. And be a truth seeker. The truth will always set you free.